Don't stress out about running the best IEP meeting you can. I've got 7 steps to get you headed the right direction! Yes, I've been checking in on Facebook groups and see there is some anxiety and stress around running a successful IEP meeting. I see people worried about how long it takes to write, what they're going to share at the meeting, and they're even worried about what to wear to the meeting. 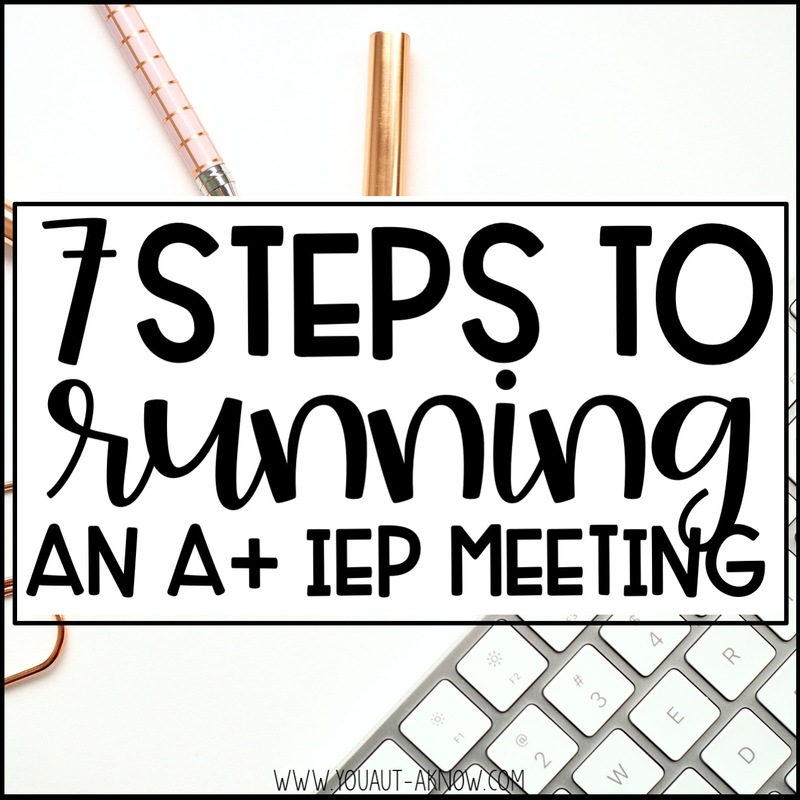 I want to share some of my tips for running an IEP meeting that doesn't have to be stressful. Breaking down the IEP process into these 7 easy steps has helped me run an A+ IEP meeting that I am proud of. Ready to dive in? Let's do it! 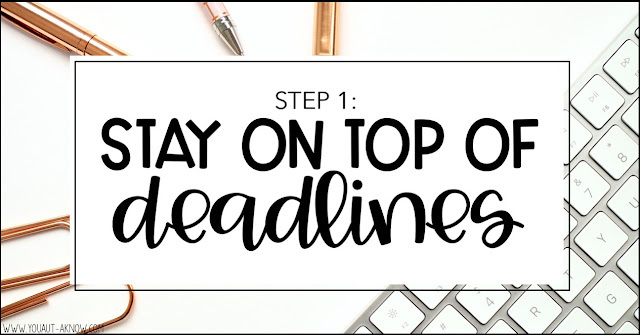 This is a pretty simple and self explanatory tip, but stay on top of your deadlines. I sit down at the beginning of the year and map out when the IEPs are due for each of my students throughout the year. I even try to calendar the meetings with my team if possible. Having an idea of when thing are going to happen is super helpful in the IEP process. Another tip, if you know you have a student who is scheduled for a reassessment, I start testing as soon as I have the consent form signed. As we get closer to the IEP date I know that the related service providers (who serve way more students than me) are going to be rushing to assess the student. 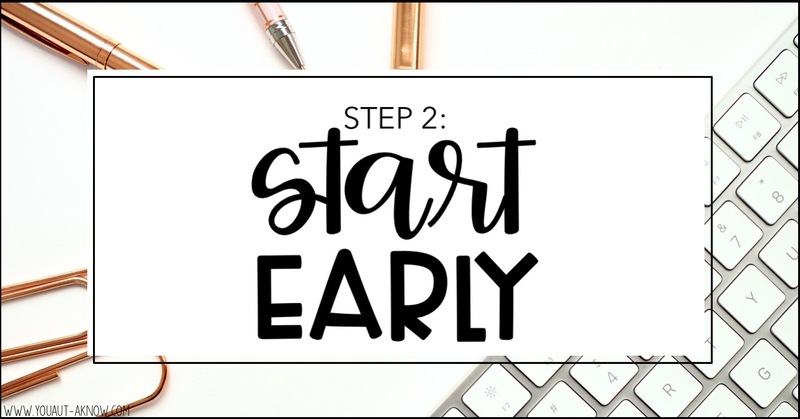 I try to get mine done early so the student isn't fatigued with testing and other providers will have time to complete their assessments as well. I know this may not always be possible when you get slammed in a month with back to back meetings, but getting an early start really helps me space out the work I need to do for a student. I'm not talking start a month early, but give yourself a week to get the things you need to do done. I get a prep time during my school day and I reserve this for writing IEPs. I take a 30 minute chunk and try to get everything I can finished in that 30 minutes. I can usually get an IEP written in the week or less, so about 2 hours total maximum. This one really helped me a few years ago. 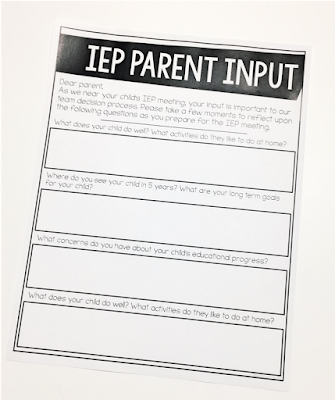 We used to come to IEP meetings with every part of the IEP drafted and ready for the meeting so we would only have to go back and make some minimal edits before affirming our IEPs, but in the last year, our district realized that completing the offer of service page is predetermination. Now I know I come to the IEP meeting without making changes to this page in my IEP paperwork. This way we are sure to discuss services during the meeting and we make a decision about what is right for the student during the meeting. Often times I'll make changes to this page during the meeting or immediately afterward to reflect our TEAM decision. I also know that some districts require drafts be completed and submitted for review prior to meeting dates. While this may not be the case for you, it is important to know what is expected to be done prior to the IEP meeting. Then make yourself a checklist and feel that joy sink is as you get to cross things off that list! This piggybacks on my information about team decisions. I make sure I involve all members of the team during our conversations about students. Before the meeting, I will sometimes send home a parent questionnaire to get them thinking about the progress they'd like to see their student making. I always start by sharing student strengths and interests and ask the team to add to those strengths. I even ask the parents what the student likes and does well at home. I continue with this involvement as we discuss present levels. I'll stop periodically throughout our conversation and ask "Does this sound like your student?" or "Do you have anything to add?" These questions will often get parents more involved in the conversation and they're more apt to share things they'd like to see worked on with their students. I also do the same thing when talking about proposed goals for students. After our school team has presented the proposed goals I'll ask "Is there anything you feel is missing?" Another thing I do to work as a team is developing goals with service providers. Often times my students are working on fine motor or letter formation goals with the OT and I'll be working on academic skills like sentence writing. Often times, the OT and I will work together to draft a goal that addresses both the academic and fine motor needs of the student. 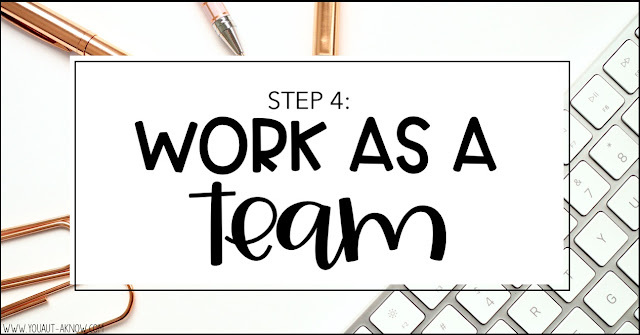 That way we can both work on the goal and the student gets the support they need from both team members. When providing present levels to a parent it's important to note what they student is currently able to do and what skills are EMERGING or next steps for the student. A present levels report shouldn't be 100% positive news. For example I might say something like "When presented with 0-20 objects, Johnny is able to count the items with 1:1 correspondence with 80% accuracy. When given an addition problem within 20, Johnny is not yet able to solve the problem." 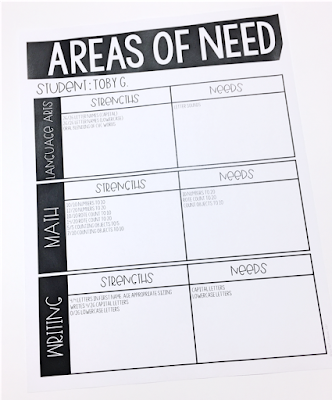 Adding areas of need into the present levels is where I begin to draft my goals for a student when we're moving forward. Any area of need or deficit is where I'm going to start writing IEP goals, so for Johnny, I will probably draft an addition goal. While I'm writing the present levels for a student I like to keep a post it note nearby and anytime I find myself typing "is not yet able to...", "...is an emerging skill", etc. I jot it onto that post it note or my area of need worksheet for goal ideas. 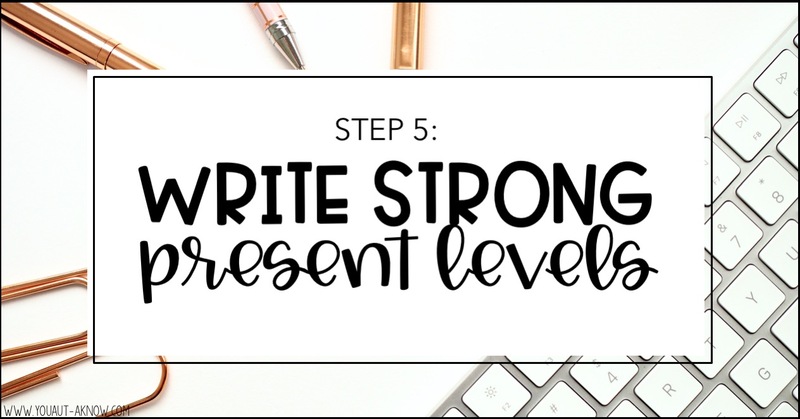 Another helpful hint when writing your present levels (you probably already do this) is to break things down. In the system my district uses, we report on a variety of domains (academic, communication, motor skills, etc.). For example I'll break down our academic skills into reading, writing and math; then I'll break down the motor skills into gross motor and fine motor to write out the students present levels. It keeps things better organized and usually keeps our conversation during the meeting focused. I know I wrote about drafting stellar IEP goals quite a while ago and you can read all about it here, but the basic gist I want you to think about when writing your IEP goals is "would someone who picked up this IEP know exactly what this student is expected to do?" Be specific in your IEP goals. Determine WHAT you're going to teach students and list it out in the goal. I've often written vocabulary based goals for students and listed the words I want them to learn in the goal itself. Another tip on goals is don't overload your students with them. 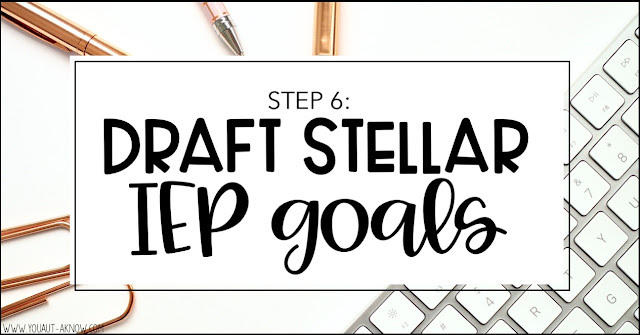 Yes, you need to write an IEP goal for each area of deficit, but that doesn't mean a student needs IEP goals for addition, word problems, and graphing. 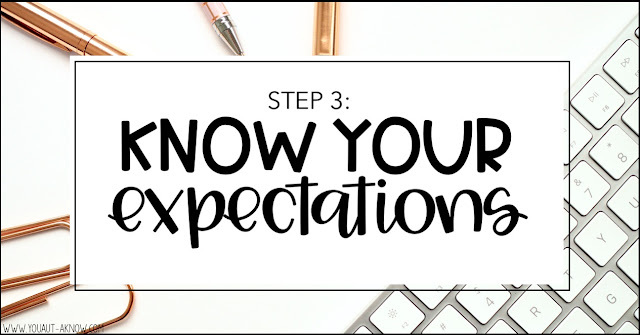 Pick one IEP goal that will help your student make the most progress towards grade level standards and start there. If they master that goal, that's awesome, draft yourself a new goal in the area of deficit and work closer towards grade level mastery. This is something that has helped me greatly. I always bring proposed data sheets and lists to IEP meetings. There are a couple of reasons I think this is important. It allows the team to see how we're planning to teach a skill (especially when I use a task analysis data sheet). It also gives family members and in home service providers a plan for teaching generalization at home. Also, it cuts down on my prep and creating data sheets after the meeting. I like to get these created while the information about the student is fresh in my mind. I'm also a fan of making word lists for students we are teaching to read. 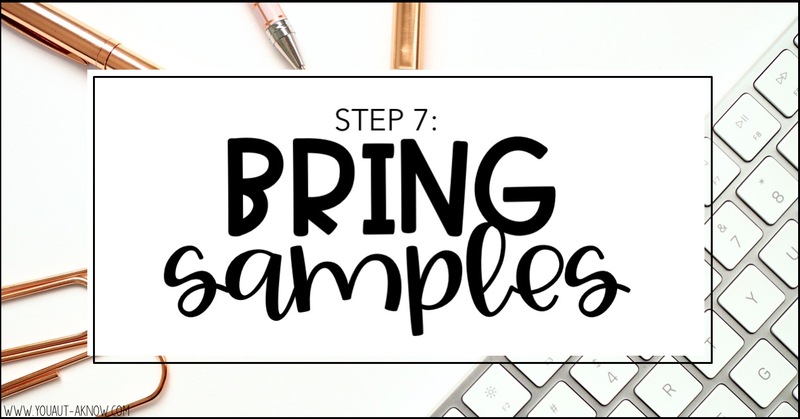 It allows for the same benefits of a sample data sheet, but I also use that to collect my data on while we're working on skills throughout the year. It also allows me to probe a student before a meeting. 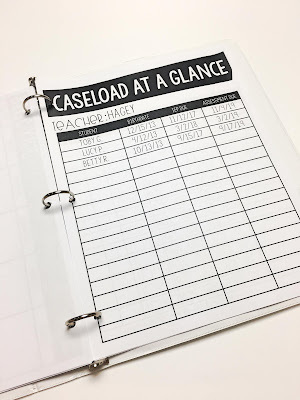 For example, if I decide I'm going to teach the student our Kindergarten sight word list but realize they already know half the words I will revise my goal and include some first grade sight words on my personalized list for the student. Having these lists already prepared before the meeting gives me an opportunity to check in with the student and make sure we're on track to help them make the most progress possible. 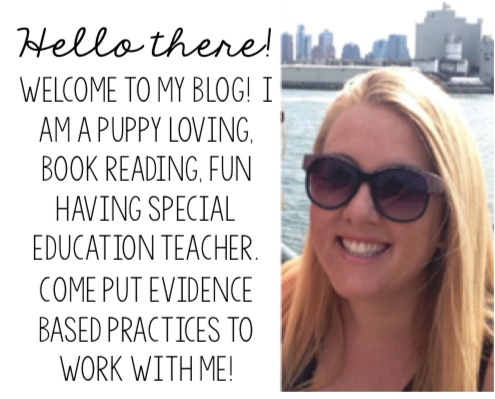 I hope these 7 tips helped get rid of some of your IEP writing stress. The best feedback I've gotten from an administrator related to IEP documents is to remember that your IEP meeting is to review a DRAFT of the documents. It's ok to discuss and make changes to the draft during your team meeting.